Well I said things would be pretty quiet here on the blog and as you can tell by my lack of posts - I wasn't lying!! I have so many lovely clothes I want to show you but what with me moving house and getting settled back into London life, I haven't had a lot of time to get proper outfit pics done sadly. 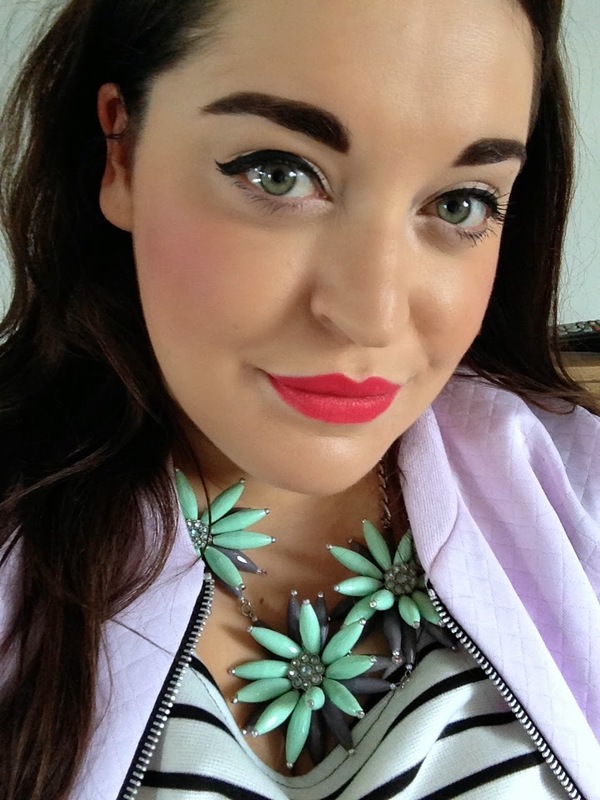 I did however want to just do a quick beauty post showing you two new purchases that I am absolutely in love with. For as long as I can remember I have always worn a pinky coloured blusher on top of my bronzer and both products have mostly come from either MAC or Estee Lauder. I recently went shopping with my Mum whilst she was here in London though and I bought a new bronzer and blusher and I really love how they both look together. Wearing no "colour" on my cheeks compared to the bright pinks I've worn in the past was a little daunting for me at first but I have been alternating between my pinks and this more bronzed look and I love it!! I feel like it makes me look all bronzed and ready for the summer months that are ahead of us. 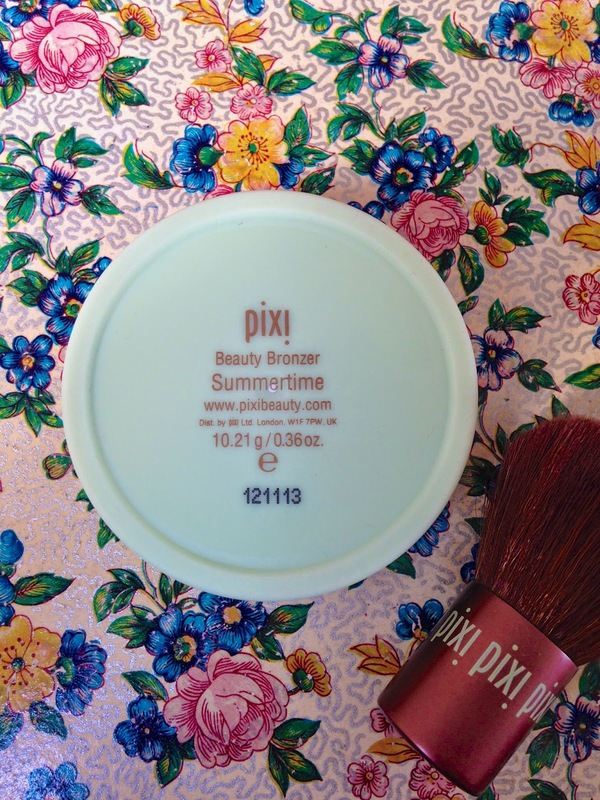 The bronzer is from Pixi, a brand I hadn't bought since I was a teenager. 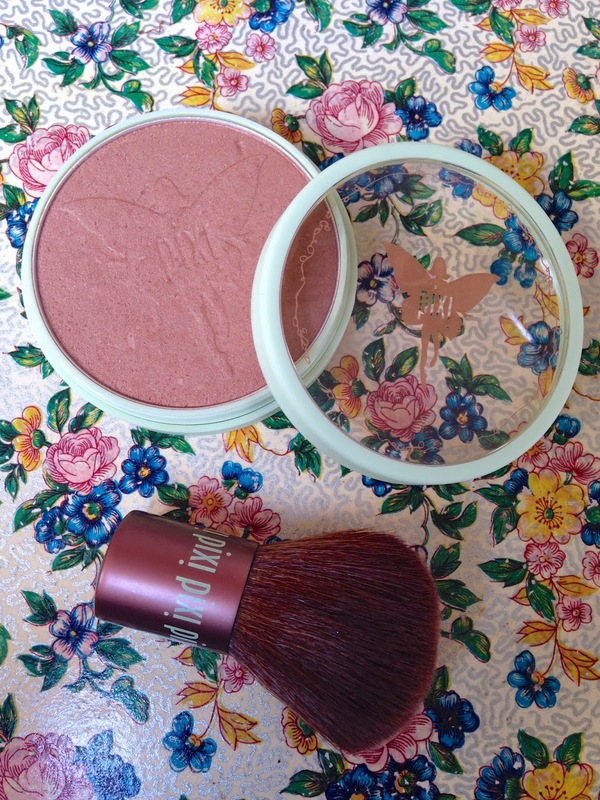 I went in to pick up a bottle of the Glow Tonic that everyone has been raving about and their Beauty Bronzers caught my eye. The packaging is beautiful, it comes with its only little Kabuki brush (which is sooooooo soft) and the colour is a really rich golden brown. There are three shades to pick from but I chose the darkest one called Summertime and although the brush is lovely, I prefer to use a bigger bronzer brush so that the colour is more evenly distributed. I don't use bronzer everywhere on my face but mostly on my cheeks, forehead and down my nose. 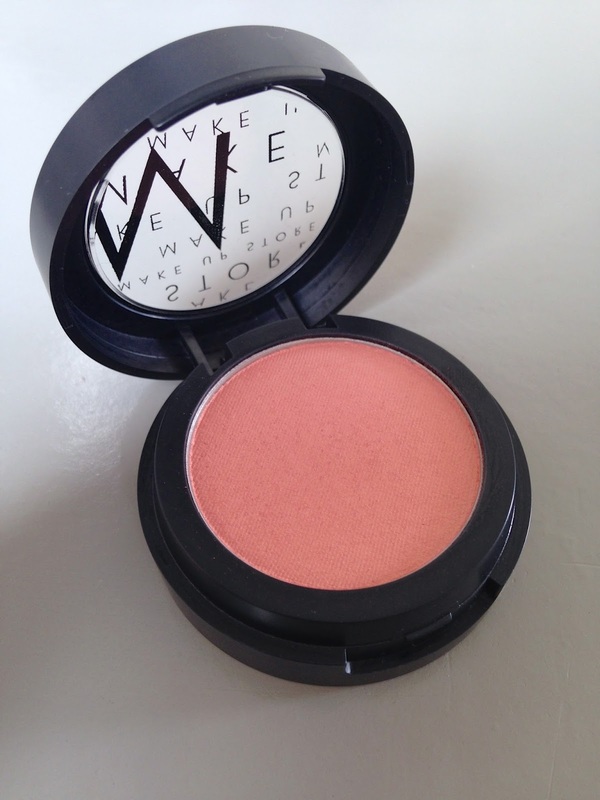 The second product I got was this really nice peachy/golden blush from Make Up Store. 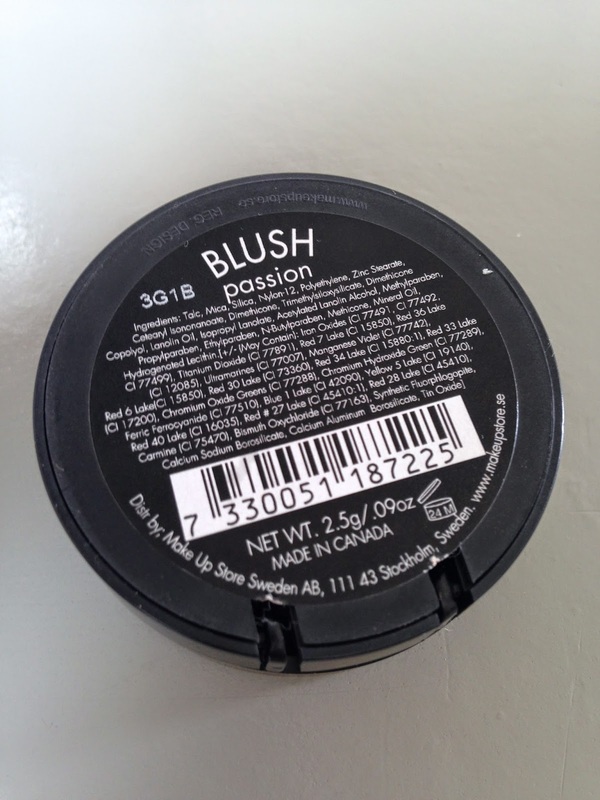 They have an array of beautiful coloured blushers but this particular one called Passion caught my eye and I am so glad I decided to try it. It gives a lovely highlight effect and combined with the Pixi bronzer it looks like I've just got back from a holiday in Spain! I picked this up in their store in Carnaby Street and the staff were really helpful and polite in there which is always a bonus of buying in store as a posed to online. What do we think girls? Should I stick to what I know best (insanely bright pinks) or do you reckon this is a good look for me? Are you a fan of these two brands? 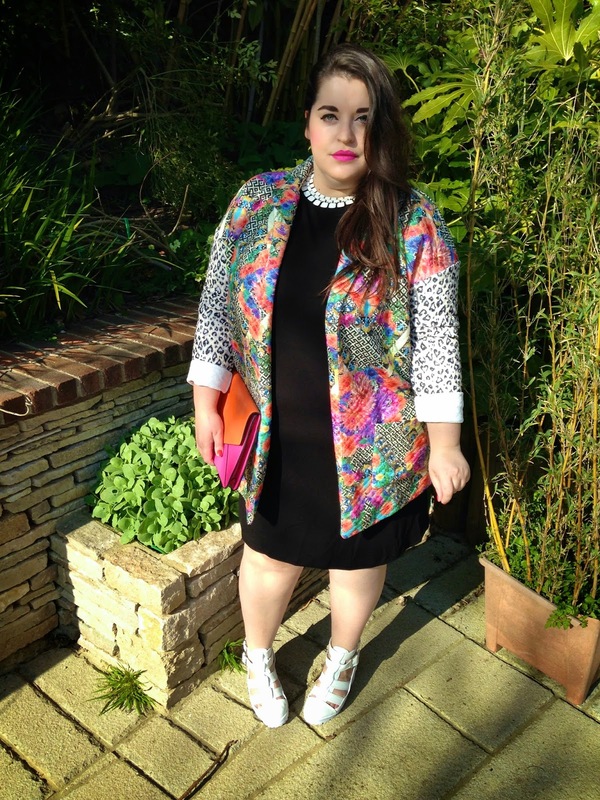 You may or may not know but Boohoo recently launched a plus size range and after attending their launch event (which you can read about here) I was kindly asked to pick some pieces to review. One of the pieces I chose was this criss cross print swing dress. 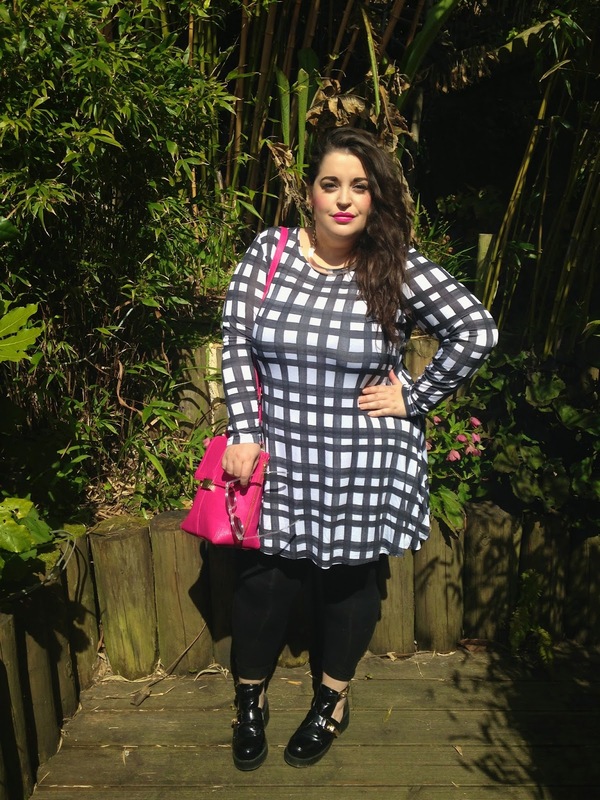 Being a fan of black and white, this swing dress caught my eye and I thought it would be a perfect jazzy basic to own. 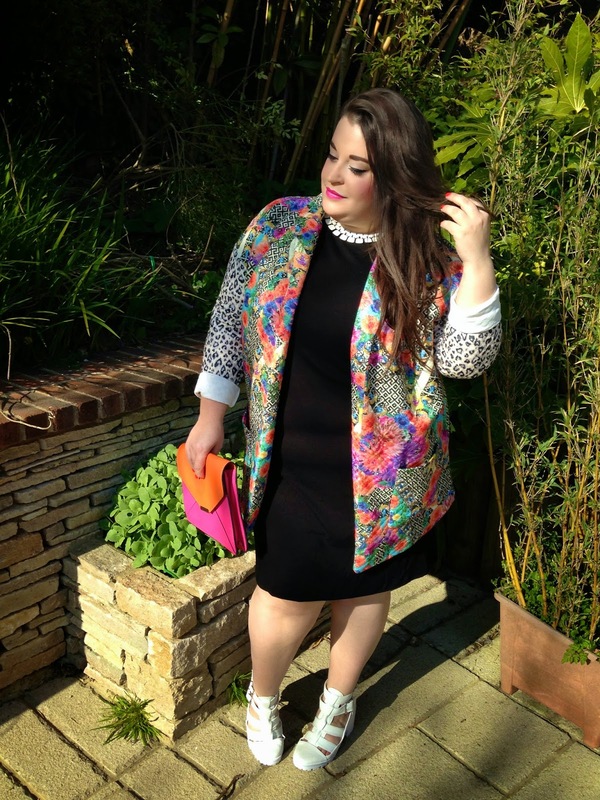 Now, as you will have read from my previous boohoo post, I am a fan of this range. 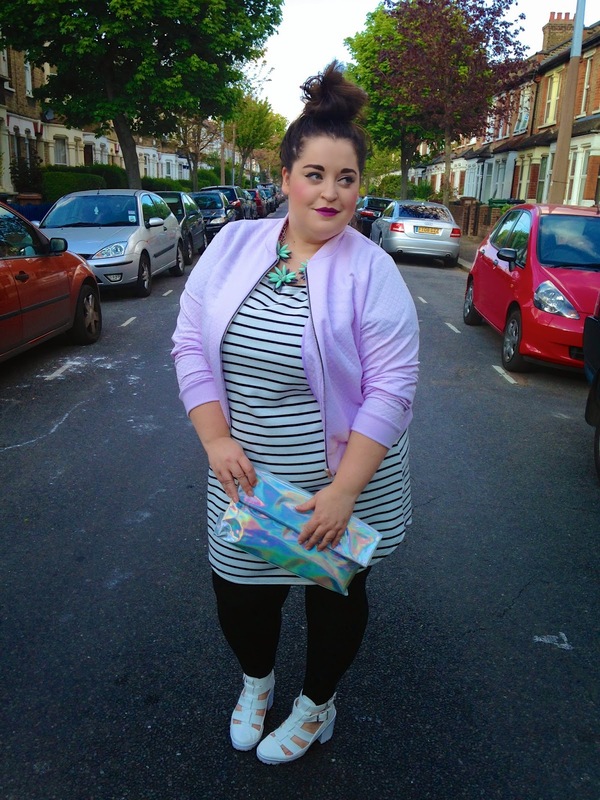 I am happy us bigger girls now have another high street shop to shop in, I am happy it is a very affordable range, I am happy with how this collection looks and I am excited to watch it grow and change each season. I am sadly not entirely happy with this dress. The print is brilliant. I love the monochrome, un-even painted feel to it. I like that it is a swing dress with long arms, perfect for this time of year when just as the sun comes out, it is covered up by a huge fluffy cloud. I like that the neck line isn't too high. I have a few swing dresses and the necklines are all very high. With this one, I find it is a good shape on me and means you get to see a teeny bit of flesh! There are two issues with this dress that mean that for me, it's not ideal. The length is wayyyyyy too short and I would 100% not wear this without a thick pair of leggings. The fabric is also a little too flimsy as well. I like that it is cotton and feels very cool on, but being so thin...it shows every lump and bump I have. I sized up in this style, to a 22 and normally that would mean a dress like this would be huge on me, but actually...I could have even done with going up to a 24! 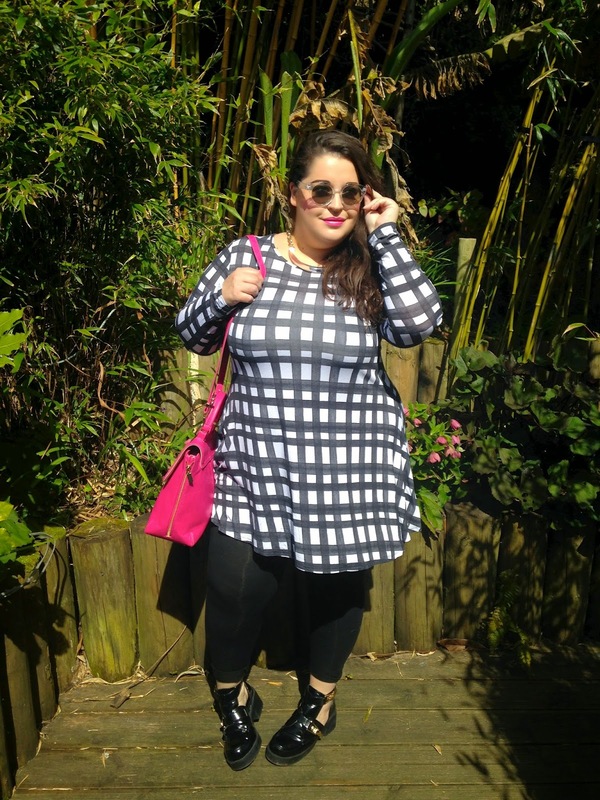 I have heard quite a few bloggers discussing the sizing issues so I hope this is something they will take on board as they receive more feedback. I paired this dress with some patent cut out boots, a bright pink bag, my new clear sunnies, perspex and gold chain necklace and a slick of my favourite Chanel lippy. I am actually reasonably happy with how the photos came out and will continue to wear this dress but I am sadly not in love with it. I do however LOVE the other item I was gifted and am looking forward to showing you that gem! 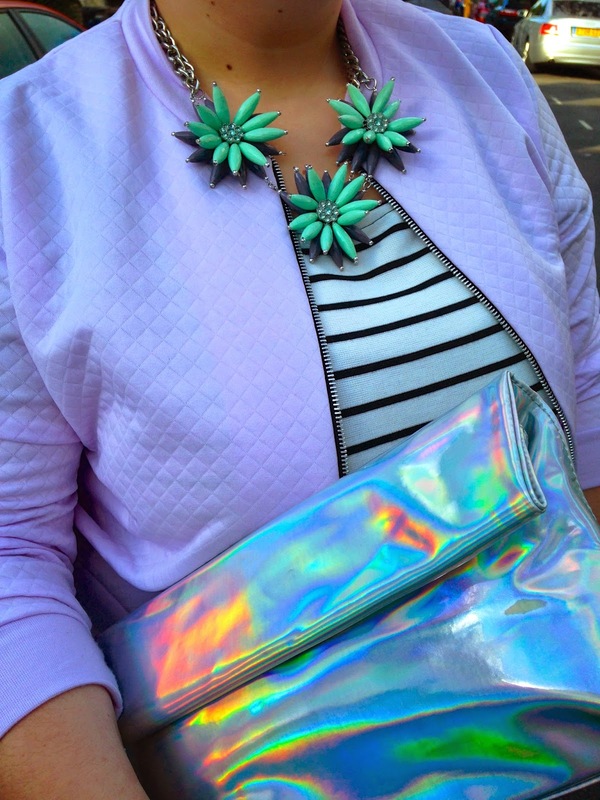 I will find the perfect thing to wear with it and make sure I post about it asap. Please excuse how few and far between my blog posts have been and I apologise in advance for the lack of posts in the next few weeks (if you are even at all bothered haha) Tomorrow I move back to London so you can imagine how hectic things will be for me. I shall try and post as regularly as possible though! What an exciting day in blogging land!!! 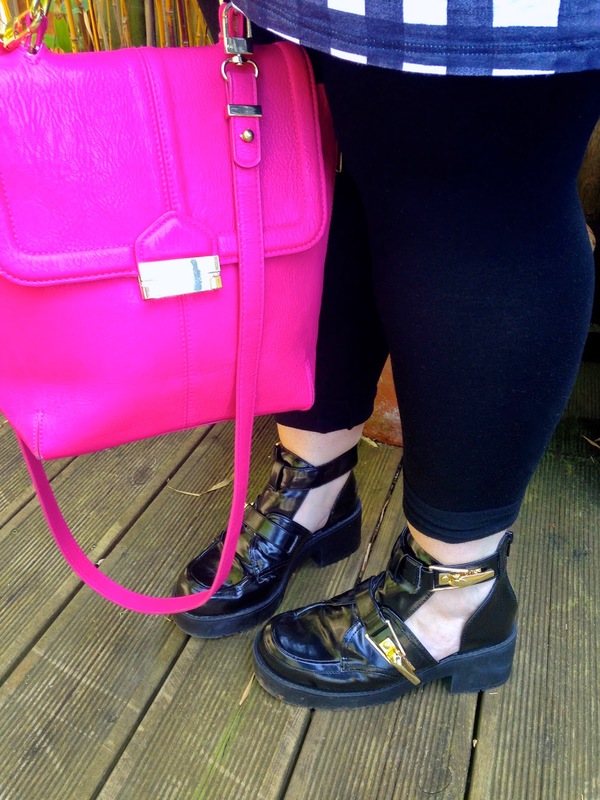 After getting caught up in some craziness on various social media channels in regards to plus size blogging, I decided to stick to what I do best(?) 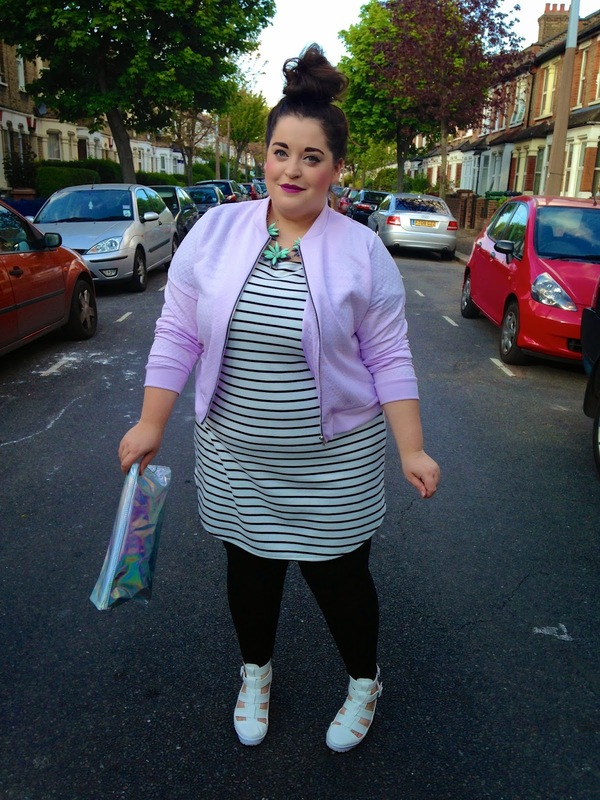 and put some fab clothes on and show you all that fat doesn't have to equal bland. 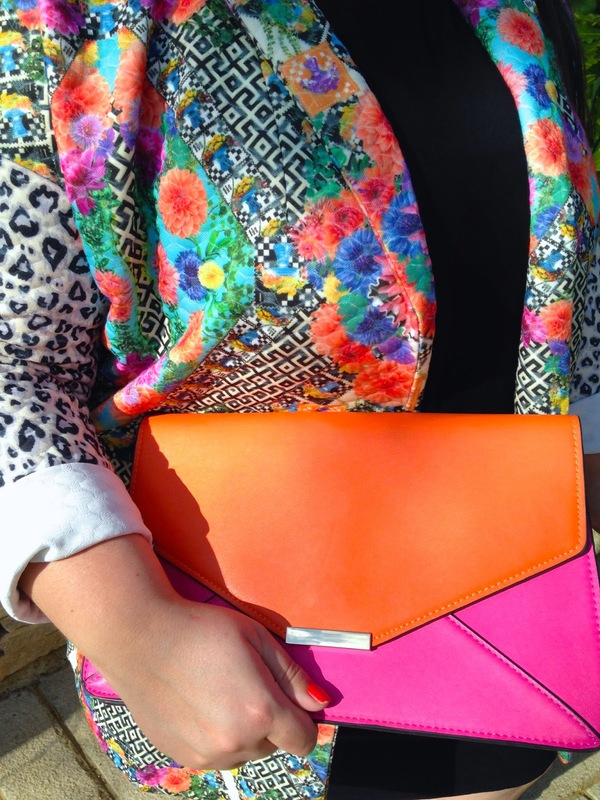 You all know by now that I like to stand out and what better way to do that than by wearing a garish print. 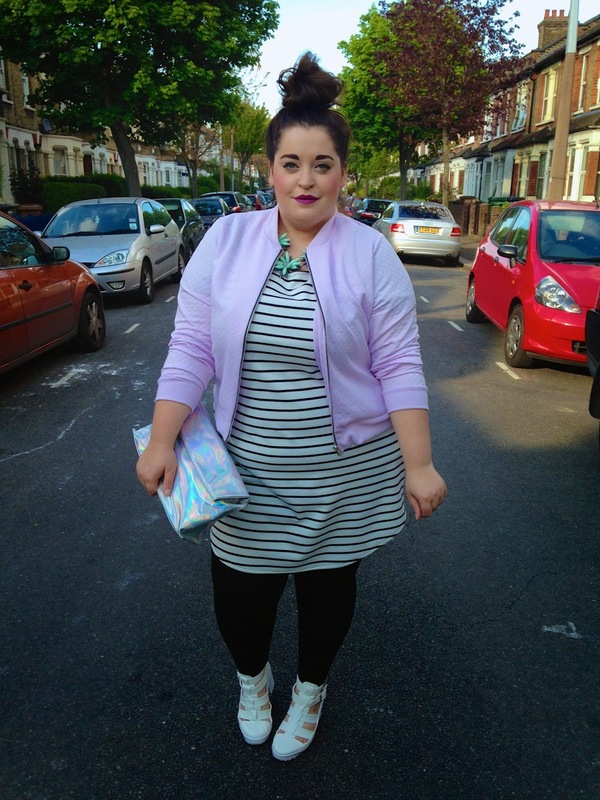 This jacket just makes me feel so happy and I don't care what people say... clothes/fashion is what I am about. I live, breathe, eat fashion and if that makes me a shallow person, well I couldn't give a toss really. I might be shallow but I'll look like a fabulously dressed shallow person. The black dress I wore underneath my crazy jacket also makes my heart sing. I do love my outrageous stuff but you can't beat a classic black dress. I like that the mesh sleeves turn a standard jersey dress into something a little more interesting and 'edgy'. In regards to fit, I got a 20. I would have ideally gone for a 22 as I thought it might be a bit snug, but sadly they had sold out of the 22. I'm wearing a slip underneath it to help smooth me out but as you can see from the photo, my belly outline is on show...it's quite a nice fit regardless so I'm ok with the fact it doesn't conceal ma bellllllly. Thank the lord for Topshop, River Island, Office and New Look. These are pretty much the only shops I buy shoes from. I can't get enough of white boots/heels/sandals and I'm so glad they are readily available now a days. I bought my beloved white high heeled brogues about 3 years ago, and I've worn them to death as I just couldn't find any other white shoes I liked. They are in every shop now so I'm going to sell everything I have (including my soul) to make more funds so I can feed my white shoe addiction. The clutch is actually my Mums and is an old Accessorize number, the white necklace is from Topshop and should still be available in store. 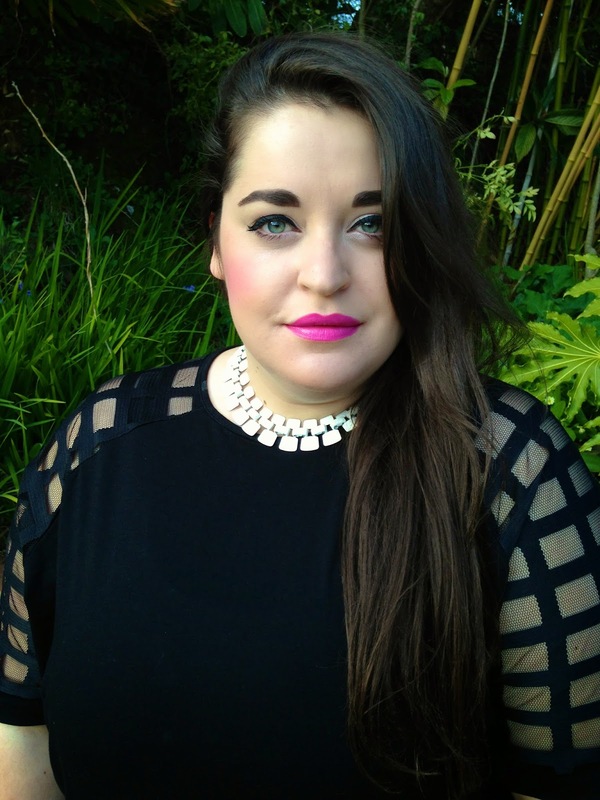 My lipstick is my current favourite that I seem to wear most days and it's by Chanel. I hope you have had a good day my loves, I know I've had a hilarious one and feel really energised. 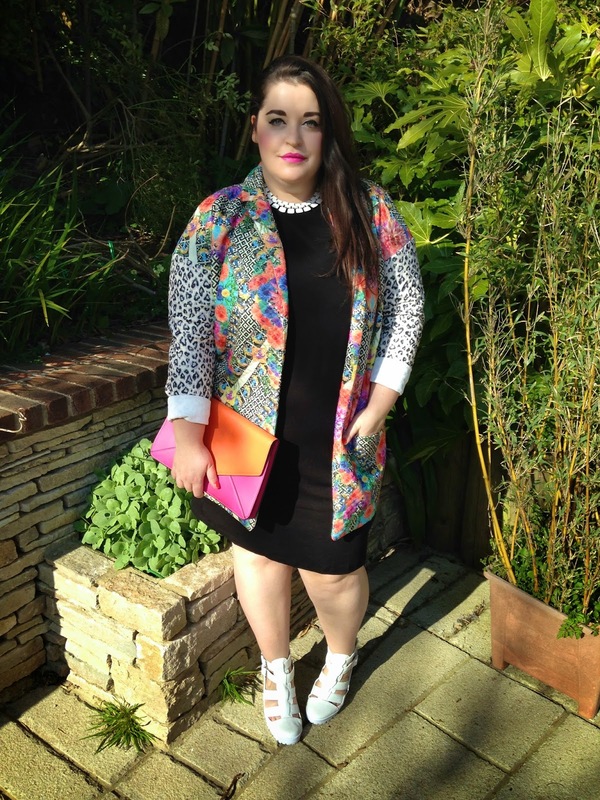 I love blogging, I love my readers and I love what this blog does for me and my confidence. I blog for YOU, the reader and myself and no one else. 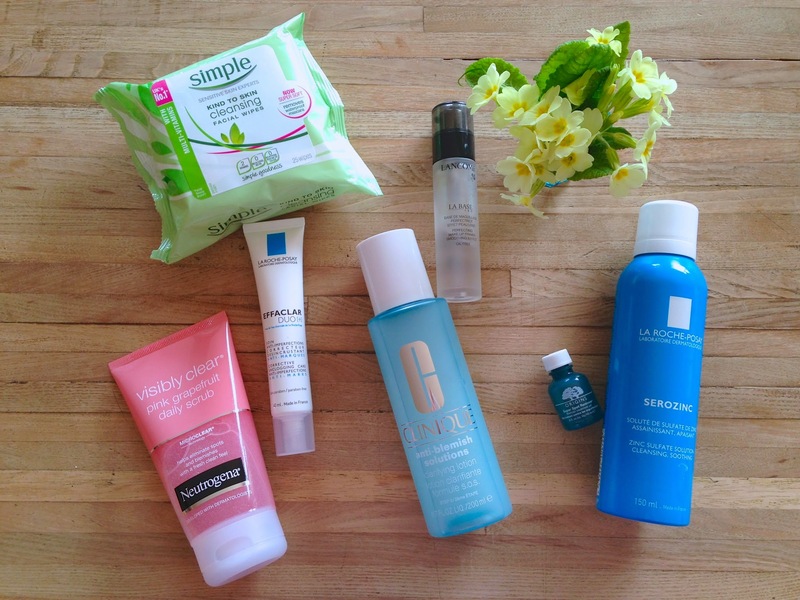 I previously used to only ever use face wash, face wipes and moisturiser as part of my skin care routine. I was blessed with very good skin only experiencing very, very occasional blemishes. That has all changed now sadly and I now have an array of problems with my skin. In an attempt to combat all these problems, I have been seriously reading up on skin care products, testing them out and although I am a long way off getting back to having brilliant skin, I am a lot closer than I was 4/5 months ago. I am still finding the perfect combination of products for my skin type and have a lot of products I want to try but the ones I wanted to show you today have been having a great effect so far! Not all are 100% right for me and I will explain why; but most are spot on! 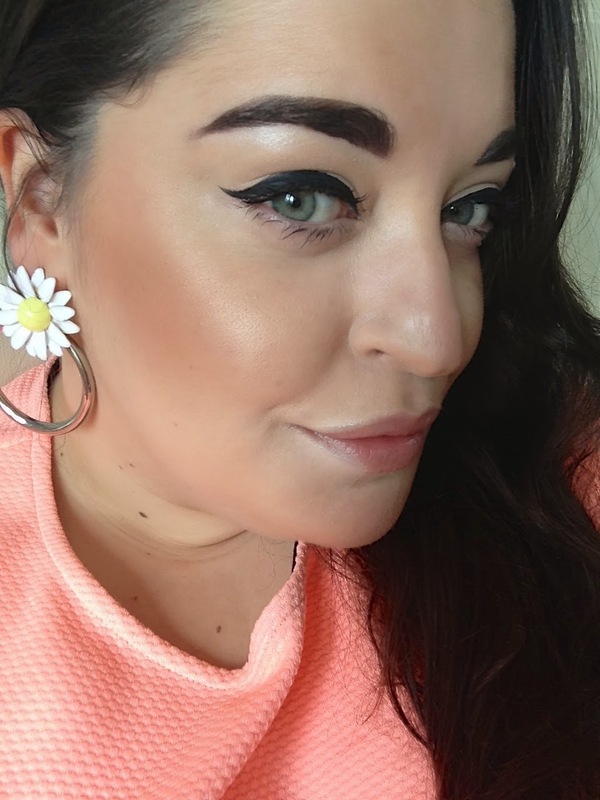 I am by no means a beauty blogger and I am no expert but I get asked about my skin and makeup on a daily basis so I thought I would write this post to show what I do to my skin in preparation before I trowel on my makeup. First thing I use in the morning is a face wash. 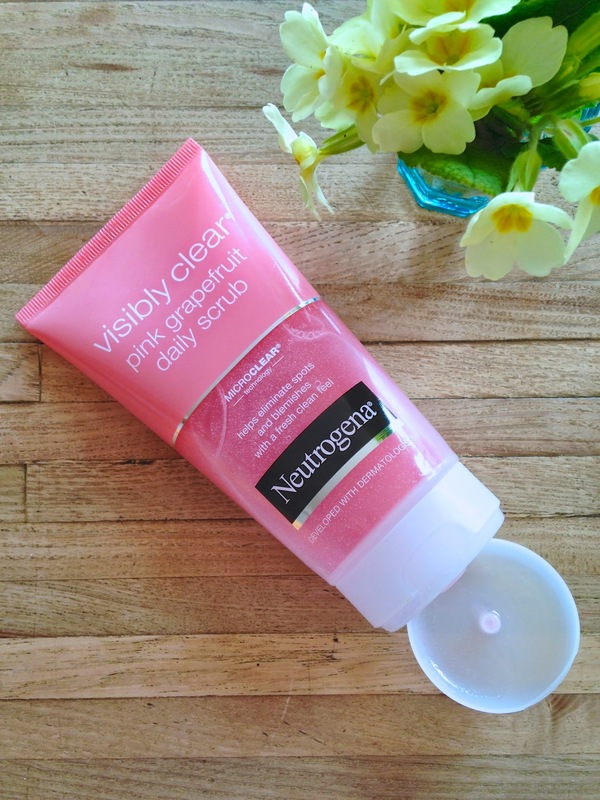 I haven't found the perfect face wash for me yet, but in the mean time I have been using this Neutrogena Visibly Clear Pink Grapefruit Daily Scrub. As well as a face wash, I am also on the hunt for a new exfoliator (I want to try something other than the Dermalogica Skin Prep Scrub which I've used for years) I thought this daily scrub would be perfect to use whilst I track down those two new products. I love the pink grapefruit scent, the colour of it and the micro-beads which help scrub away dry patches of skin and clean out my pores. I always find my makeup goes on so much better after I have given my skin a proper scrub. The next thing I use is a Simple Cleansing Facial Wipe to make sure there is no makeup left on my neck or around my eyes/behind my ears etc. 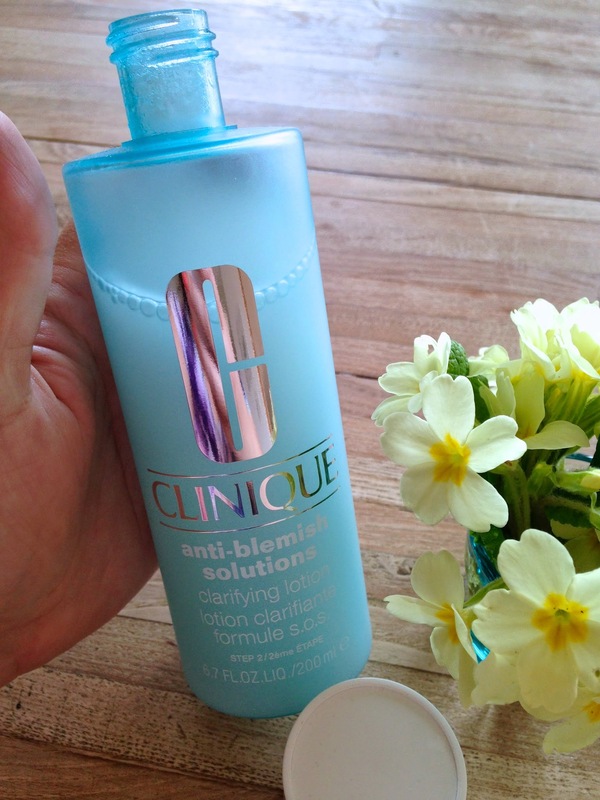 After I have used a wipe I then move on to using Clinques Anti Blemish Solutions Clarifying Lotion. Now, I'm not entirely happy with this product but it has helped clear my skin up and I will use it when my skin is particularly bad and I really want to help dry out an area. The problem I'm having with it is that although my skin can be very oily, this product is drying my skin out a little too much and I am getting dry/flakey patches. This clarifying lotion is meant to help exfoliate dead skin away BUT I think this particular anti blemish solution is too drying for me and I need something a little more suitable for combination skin. You shake this lotion up vigorously as it tends to settle and you use it on a cotton wool pad and sweep it over your face. Be careful not to drag it over your face too roughly or move the pad back and forth lots, you only need to wipe it around your face softly. I really want to try a clarifying lotion by REN called Clarimatte Clarifying Toner after it was personally recommended to me by my fave beauty blogger Sandra, over at The Black Pearl Blog. It looks to be a great toner and I will have to pick some up when I go and see my friend who happens to work on the REN counter in Liberty's *Waves hello to Scarlet*. Next up is an A-MAZ-ING product called Super Spot Remover by Origins and I use this on all of my blemishes and break outs. 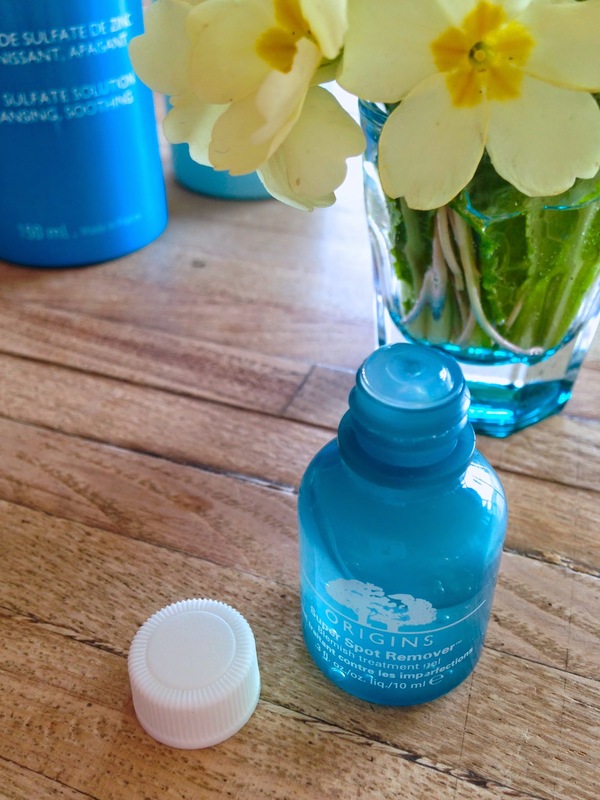 I had read about this on a number of beauty blogs and when I was near an Origins stockist I nabbed myself a bottle. It is £14.00 for this tiny bottle BUT I don't care. In my opinion is is 100% worth it. I use this in the morning and at night and the clear gel sits on the blemish and acts as a little shield. It helps to clear up the spot, dry it out and helps clear up that red, angry appearance they tend to have. Honestly, you put it on a horrid blemish at night and in the morning it is visibly calmer and looks less like a erupting volcano. I love, love, love this product. 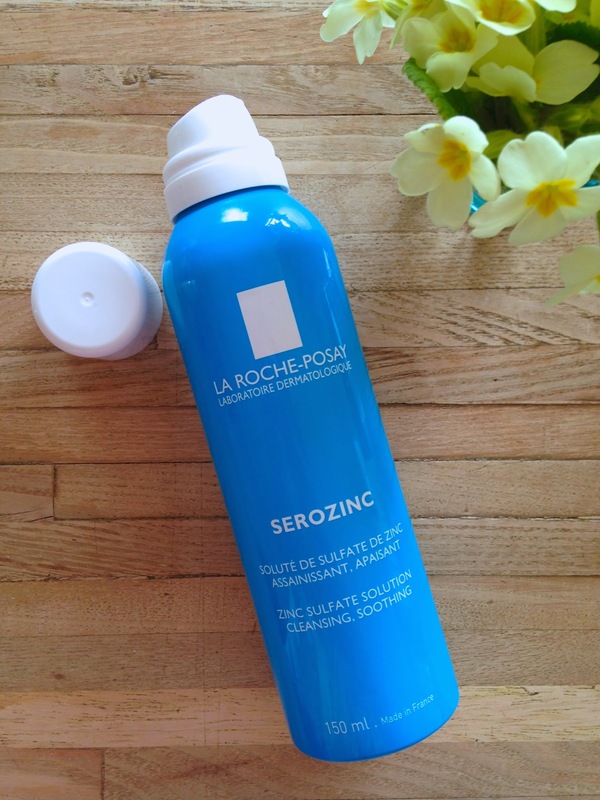 After I've applied the spot remover gel, I spray my face with another a-maz-ing product called Serozinc. 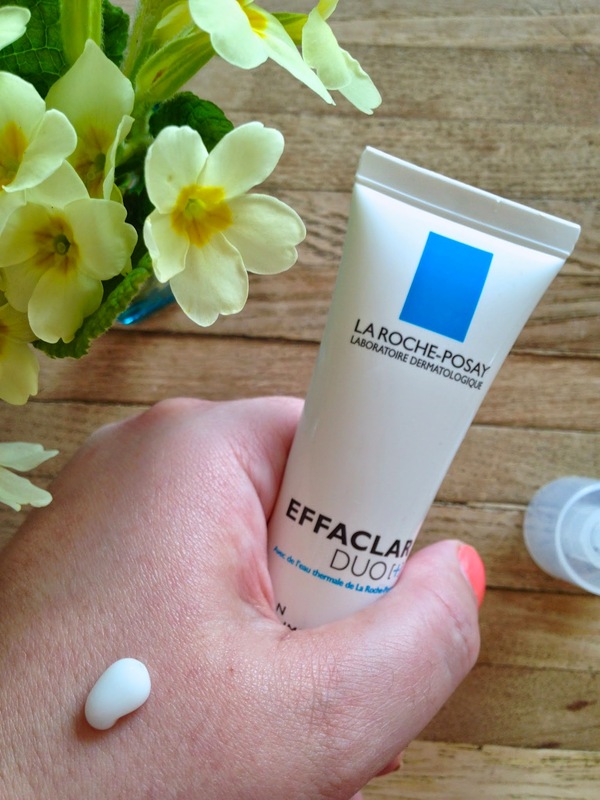 This is by skin care brand La Roche-Posay and I am in absolute love with this product. I will be re buying this spray as I can tell I will re-use this for a very long time. The zinc sulphate in the solution promises to soothe and cleanse your skin and help reduce irritation and redness. It does exactly what it says on the tin. I can see why so many people, including my Mum, rave about this product. I get really bad irritation underneath my mouth and either side of my nose and since using this, that redness and soreness has dramatically improved. The cooling mist feels lovely and I use this in the morning and in the evening. 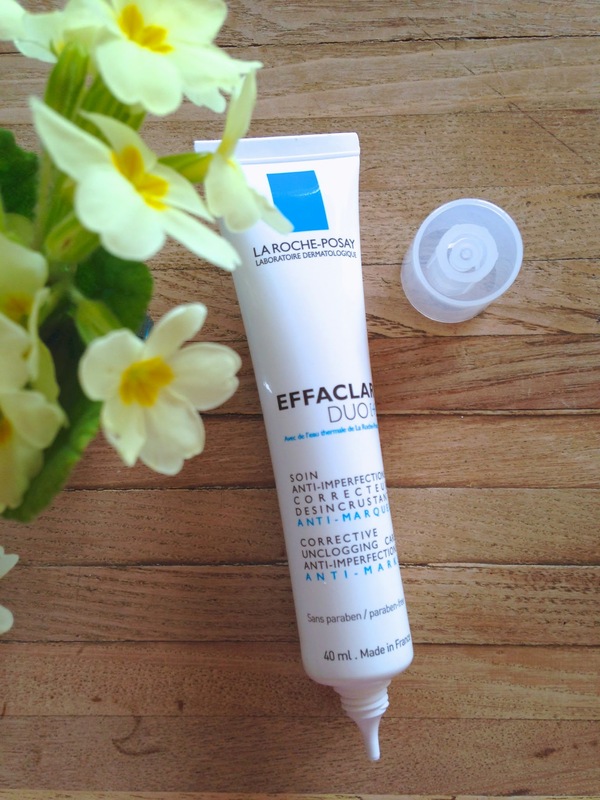 After I have used the Serozinc, I move on to the next process which is to apply a thin layer of La Roche-Posays Effaclar Duo+. I haven't had this very long so I'm yet to see a huge difference to my skin but head over to Sandras blog to read her review here. I am really excited to see if this product works for me as I scar really badly after I have a spot, it sticks around for weeks, sometimes months and although my concealer and foundation cover those dark spots up reasonably well, it would be nice if I didn't get them so bad and it also promises to un clog your pores. This can be used as a make up base as well so for those of you who like your makeup to go on nice and smoothly, give this one a go. It's a really nice smooth, cream which has a very pleasant smell to it. 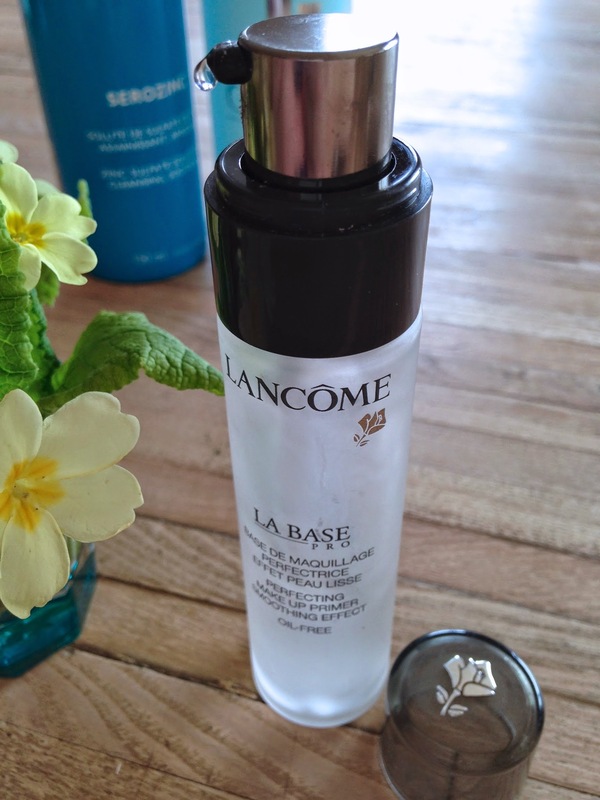 Lastly I use my Lancome Primer called La Base. This is such a silky smooth primer and it is so easy to apply. I find that using it helps my makeup glide on and it also makes my makeup stay put for a lot longer than it would without one! I love this primer but I was recently recommended one by beauty brand Becca which you can buy from Space NK, so that is next on my hit list. I hope you have enjoyed reading about my routine and it's maybe inspired you to take a look at your own routine and the products you use and see whether you're happy with the products you use or if you think it's time for a change. Can you recommend any amazing cleansing foams/face washes to me and also an exfoliating face scrub I could try? Oh, and a moisturiser as I haven't featured it here, but I don't like my current Simple moisturiser and haven't been using one very much which is very naughty!